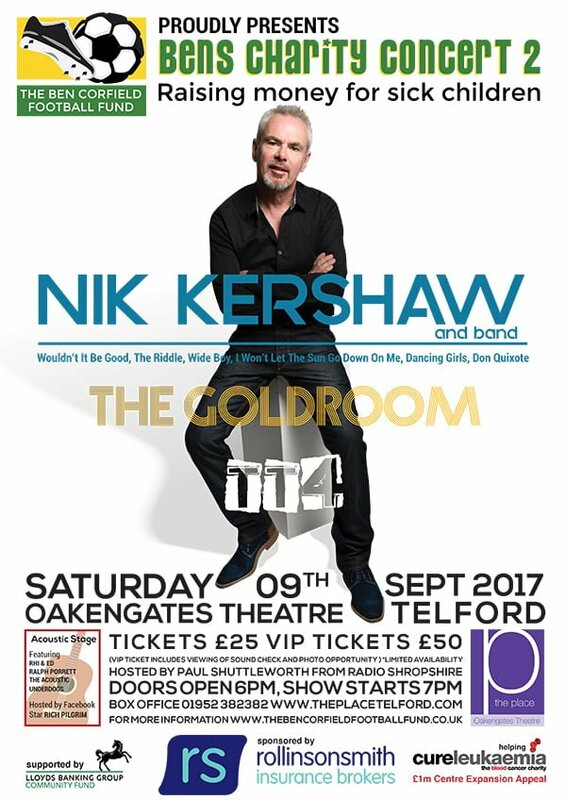 Nik Kershaw is delighted to be taking to The Oakengates Theatre stage in Telford on Saturday 9 September 2017 for Ben’s Charity Concert 2. Ben Corfield is a 7 year old boy who lives in Little Wenlock in Telford. Ben was diagnosed with Acute Lymphoblastic Leukaemia in February 2015. His life has been like a whirlwind since. Inspired by Ben’s love of football, Ben’s dad and a group of friends established The Ben Corfield Football Fund. Ben is sadly not alone in his condition. There are countless other children dealing with illness of all types from a very young age. The Ben Corfield Football Fund aims to help poorly children and the services they rely on so much. Tens of thousands of pounds have been raised for The Ben Corfield Football Fund. Ben’s Charity Concert 2 will raise money for Cure Leukaemia, the blood cancer charity supporting the building of a world class haematology centre at Queen Elizabeth Hospital in Birmingham. There are currently two support acts – Telford band The Goldroom, who took part in the first charity concert last year and TT4. For the first time, there will also be an acoustic stage this year in the bar at Oakengates Theatre for an after-show party. This will also have three acts performing and confirmed so far are Rhi and Ed and Ralph Porrett. The event will be hosted by Paul Shuttleworth from BBC Radio Shropshire with the after-show party and acoustic stage will be hosted by Facebook star Rich Pilgrim. VIP upgrades can also be purchased to watch Nik soundcheck and have a photo opportunity! These need to be purchased in addition to a regular ticket.